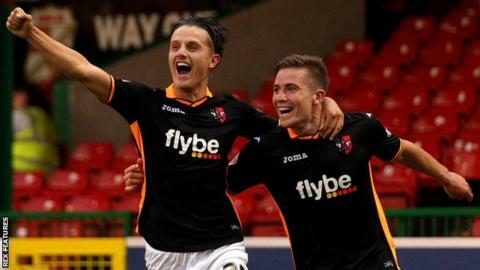 Exeter City boss Paul Tisdale says he "could easily lose" his two leading scorers David Wheeler and Tom Nichols before the end of the transfer window. Both are out of contract in the summer and have turned down new deals, with clubs showing interest in the pair. "We're open to offers during January because that's business and that's how we have to do it," Tisdale said. "I'm hoping they'll sign but they haven't, so the transfer window is an opportunity for clubs to look at them." Nichols, 22, was Exeter's top scorer last season and has 10 goal in 2015-16, including one in the FA Cup against Liverpool on Friday. As he is under 24, the League Two side would receive compensation for the striker should he leave in summer, while Wheeler would leave for nothing. "I'm more than happy to circulate David Wheeler's name to other clubs because by the end of the season we won't have an opportunity to make any gains from him," Tisdale told BBC Radio Devon. "We shouldn't begrudge David, Tom or any other players wanting to get to a higher level, and over the next couple days we'll have more discussions. "We don't have to take any offers. We can take the right offer if it comes up, but if it doesn't come up we're more than happy to keep the players." Tisdale, who signed striker Jayden Stockley on loan on Monday, may bring in more players in January, adding: "I have to make sure we're strengthened and not going to get caught short - that's the bottom line."